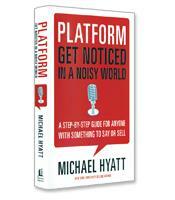 Michael Hyatt, former CEO of Thomas Nelson Publishers, shares the knowledge he has gained from creating an online following of hundreds of thousands by offering step-by-step plans for building your virtual stage. The real challenge is getting the attention of those who might buy your product or service. Hyatt shows you how. How to create a compelling product and package it with the wow effect and a great name. How to create an elevator pitch for your product, service or cause. The elements of providing a wow experience. What common blogging mistakes you need to avoid. How to deal with the issues of not enough comments or too many. How to protect your intellectual property without shutting out your readers.